Chances are you have a lonely plate in your cupboard that does not belong to a set. If so, give it new life as a stylish accessory for your home. If you're lucky enough to have several mismatched plates, use them as a basis for a collection you can hang on a wall or use as picture frames. There are lots of ways to DIY a memo board using upcycled objects from around the house, but it doesn't get any easier than these chalkboard plates. 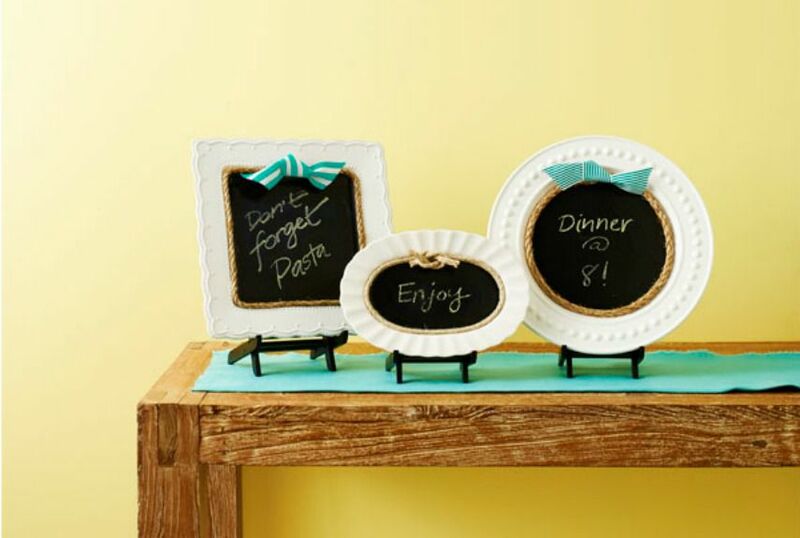 Spray paint the center of a large plate with chalkboard paint for a pretty place to write messages or jot down a grocery list. Plates with decorative rims make wonderful picture frames, especially for old black and white family photos, which add to the charm. A grouping like this could be placed on a console table or even hung on a wall as a visual family tree. Instead of a photograph, attach a round mirror to the center of a large plate or charger to make a trendy sunburst mirror that costs much less than retail. (Mirrors can be purchased from craft stores or even the dollar store.) To unify a grouping of these for more presence on a wall, spray paint an assortment of plates with the same color, like a metallic gold or copper. A plate can also be turned into a clock by drilling a hole in the center and attaching a simple clock kit, which can be purchased inexpensively from craft and hobby shops. This one has a romantic, cottage look; however, a mid-century or contemporary plate that has a more graphic design would also look great. This clever blogger attached a vintage-looking hardware knob to the center of a plate to use as a light-duty hanger for her apron. This sweet look would be great for a country kitchen or a nursery. Plates make pretty and useful spots to drop spare change and keys on an entry table. To add more interest (or a touch of quirk or humor) to a plate you may have in your cupboard, try adding image transfers for an element of surprise. There are so many ways to use tiered servers around the house. They can hold toiletries, jewelry, and school supplies to name a few. Make your own three-tiered stand by gluing three plates and upturned cups or candlesticks together. Plates tucked into planters are perfect for kitchen gardens full of herbs, tomatoes, and other vegetables. These blue and white plates add some color and farmhouse charm to a trio of galvanized planters. You could also make plates into garden markers by adding the names of plants to the plates using image transfers or exterior paint. Inspired by any of these pretty plate projects? Perhaps you'd like to create a gallery wall using plates ​or display some family photos using a mismatched assortment. While department stores typically only sell plates in sets, there are plenty of places to find inexpensive options that you can buy individually so you're not stuck with a lot of matching plates you don't need. These retailers also carry sets of dessert or salad plates that have patterns and motifs that coordinate but aren't identical. And don't forget melamine options, which are lighter and easier to hang.